The Coaldale-Lethbridge Growing Project’s numbers are in for this year, and they’ve had a pleasant surprise. A hot and dry summer made for some low harvest yields predictions, but the numbers they got were way better then expected. “We were humbled and impressed with the harvest this year. Weather conditions in southern Alberta, as everyone is well aware, were challenging with the extreme heat and lack of rain. But the crop produced extremely well in spite of these conditions,” said Larry Penner, media contact for the growing project. An average of 125 bushels an acre of barley was produced, and over 50 bales of straw was produced. The proceeds from the sale of the crop and the straw were over $164,000, and they raised over $23,000 of harvest day donations from the BBQ. 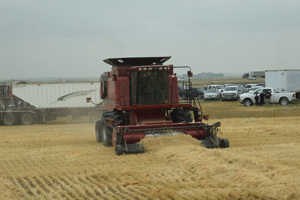 The growing project harvest 125 acres east of Coaldale, with 18 combines, eight swathing units and eight baling units coming out to help with the harvest. All proceeds of the harvest will go toward the Canadian Foodgrains Bank, which is a partnership of 15 church and church-based agencies working together to end global hunger. In 2016-17, Canadian Foodgrains Bank helped over 900,000 people in 35 countries. This year is the 35th year in existence, and it has raised almost $1 billion to help those in need around the world. Penner says that growing projects allow those in places like Canada to volunteer and participate in feeding people around the world, and gives people the opportunity to partner with agencies that have the resources to do so. Growing projects rely on donations to cover the cost of the crop and land, so they can give as much as possible to those in need. Currently, the Coaldale-Lethbridge Growing Project is looking for a quarter section of irrigated land near Coaldale or Lethbridge to rent for next year. Anyone interested in renting land to the Coaldale-Lethbridge Growing Project can contact Penner at 403-382-7222.